A well-balanced diet is composed of all important classes of food including minerals. Among the most essential minerals required by the human body at all ages is iron. It plays an important role in sustaining life. Therefore, a deficiency can lead to a huge set of problems. The following discussion explains what is iron deficiency and its causes, symptoms and treatment. The deficiency of iron is defined as a condition characterized by lack of iron in the body owing to either poor absorption of the minerals or too little intake through food. The term anemia is synonymous to iron deficiency. It is a disease caused as a result of the shortage of this extremely important mineral in the body. The disease may vary in severity depending upon the extent of the deficiency and how prolonged it has been. The deficiency of iron results in several signs and symptoms to be experienced, such as fatigue and impaired immunity. More information about the mineral’s importance, causes behind its deficiency, and symptoms are discussed below. In addition, papillae - which contain taste buds – disappear and patients face difficulty eating and enjoying food. Due to swelling, speech is also affected. The deficiency of iron is a concern since the mineral plays an important role in some of the most significant processes of the body. It is important in the following ways. Iron forms part of hemoglobin – a protein essential for the transport of oxygen to all parts of the body through the blood. 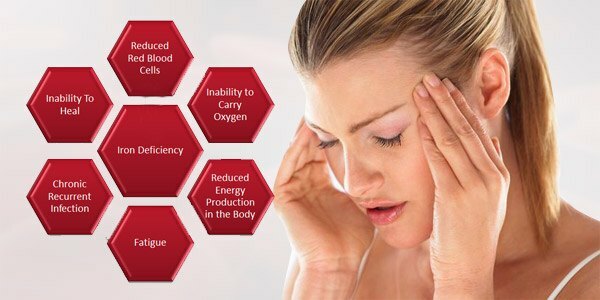 A lack of oxygen causes fatigue, impairs brain function and affects the immune system. It is a vital component of many enzymes which play a part in important body functions, such as digestion. Iron is also essential for the formation of myoglobin. It is a protein which supplies oxygen to muscles and plays a significant role in maintaining muscle health. The following three reasons create a shortage of iron due to which the body fails to meet the requirements which are necessary for various important functions. One of the main reasons which lead to this condition is insufficient intake of iron through food. Individuals suffering from this deficiency should include natural sources of the mineral in diet or consult a physician to get prescription for an appropriate supplement in order to fulfill the daily iron requirements. In addition, it is important to know the exact amount of the mineral required by each individual since the required daily dose varies based on age and gender. The intake should be according to the following figures presented by the National Institute of Health, United States. Between 13.7 and 15.1 milligrams per day for children aged 2 to 11 years. 16.3 milligrams per day for children and teenagers from 12 to 19 years of age. Between 19.3 to 20.5 milligrams per day for average adult men. Between 17 to 18.9 milligrams per day for average adult, non-pregnant women. 27 milligrams by pregnant women. In case the above requirements are not fulfilled, individuals face the risk of developing the deficiency of iron. Often, an iron deficiency or anemia is developed despite fulfilling the daily requirements. This is because of poor absorption of iron by the body. The following points should be kept in mind in order to understand this cause in detail. Individuals who consume more vegetables than meat are at a higher risk of iron deficiency since the body absorbs mineral thrice as efficiently from poultry, red meat and fish than it does from ingested plant matter. Excessive intake of antacids decreases the amount of stomach acid and absorbed iron. The intake of polyphenols, calcium or phytates – found in sources like black tea, green tea, coffee, milk, legumes and whole grains – decreases iron absorption from non-heme iron groups such as fortified cereals and spinach. A deficiency of vitamin C may lead to poor absorption of the mineral. Vitamin C enhances iron absorption from non-heme sources when both are consumed together. The body’s requirement for iron may increase during the following conditions. In case of a failure to fulfill this requirement, iron deficiency may develop. During pregnancy for healthy development and growth of the embryo as well as for the mother’s health. In case of excessive blood loss which may be caused by serious injuries from an accident, frequent blood donation, heavy menstruation or intestinal infections, such as hookworms. The following symptoms are associated with the deficiency of iron. In case an individual experiences all or most of the above mentioned symptoms, it is an indication of a severe shortage of iron in the body. Iron deficiency causes the following medical conditions. Anemia – the condition results from the shortage of iron which leads to inadequate hemoglobin for oxygen transport. As a result, the symptoms experienced include paleness of complexion, extreme fatigue due to the lack of oxygen supply round the body, shortness of breath, dizziness, headache, pain in the chest, weakness and increased vulnerability to infections. Glossitis – the condition is marked by a swollen tongue. It is caused by inadequate formation of myoglobin which in turn results in poor oxygen supply to the tongue muscles. As a consequence, inflammation of the tongue occurs. Individuals should consume the recommended daily dose of the mineral in order to prevent its deficiency. Iron supplements are prescribed by physicians in order to fight severe deficiency which results in the related medical conditions. In case of sudden loss of blood, the resulting deficiency is treated through blood transfusions.